Marvin V. Roane was born in Richmond, Virginia. After graduating from John Marshall High School, he enlisted in the U.S. Army, toured overseas, and received administrative and management training. While in the military he attended Austin Peay State University. After his honorable discharge he developed his leadership and management skills while working in corporate America and State Government. His passion though was people and community development, especially children. He left corporate America to pursue his dreams of developing children's and adolescent programs. He attended JSRCC where he received his Associate Degree in Early Childhood Education and a Career Studies Certificate in Early Childhood Development. He also attended Virginia Commonwealth University and the University of Phoenix majoring in Psychology. He co-founded The East End Renaissance Council, a non-profit organization to help under served youth and families in Richmond, Virginia. Additionally, Marvin founded ROANEnterprises, LLC where he established group homes and independent living programs for adolescent, at-risk boys. His vocational programs includes a barbering school, GED program, counseling/therapy, culinary program, music studio, fitness center, art program, auto wash/detail training program and an after-school program. He also developed the PEACE Personal Development concept and program, housed the program at the PEACE Center in Chesterfield, Virginia and The Education Center for PEACE and Personal Development along with PEACE summer program (www.peacecamp.weebly.com) in Richmond, Virginia. He has studied and practiced meditation under the Washington D.C. and Richmond, Virginia Metaphysical Study Groups and currently teaches meditation, relaxation and stress reduction techniques in Richmond and Harrisonburg, Virginia. His love for people has led him to his latest endeavor, The Empowerment Works, where he offers Empowerment, Mentor and Coaching services along with Meditation/Relaxation Classes and Small Business Consulting to those in need. 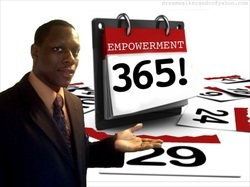 Additionally, he serves as a motivational speaker, holding monthly community Empowerment Workshops that focus on Personal Development, Self Help and Self Improvement.